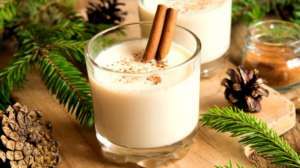 Every year when the eggnog first hits the shelves in the grocery store, I can't wait to have some, but it so full of sugar and fat. So this healthy eggnog recipe using almond milk as the main ingredient in exchange for the cream and sugar. Not only does it taste amazing, one cup of vanilla-flavored, unsweetened almond milk only sets you back 30 calories. To get a cup of anything for 30 calories is nothing short of a miracle. And that’s just the start. Almond milk is also high in magnesium, potassium, and vitamin E. And if you haven’t tried it, it’s a great “milk” for those who are lactose intolerant. Here’s the rest of the recipe, which includes USANA’s French Vanilla Nutrimeal™. Place all ingredients into a blender. Blend until smooth. Serve immediately. And enjoy staying healthy this season!